Authentic Essays | Custom Research Paper, College Term & Essay Writing Services parts of an engine What is the function on the following four stroke gasoline engine parts? What is the function on the following four stroke gasoline engine parts? 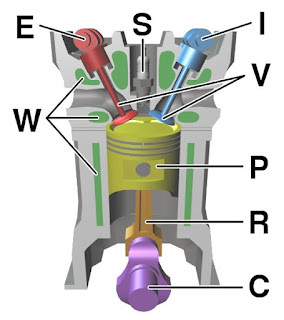 The intake valve is a valve that allows intake of fluids or air through an engine during the engines operation. In cars this is known as the internal combustion combustion engine. Intake valves creates room for the combustion of air and fuel. The exhaust valves main function is to enable air in and out of the cylinders. The incoming air is used to enable the ignition of the fuel which in turn drives the pistons up and down. A valve cover is used to prevent oil leakage in the upper engine. It protects the engine and the cylinder head from leaks of oil, water and any other fragments. The intake port is part of an automobile’s air intake system that is responsible for managing the air required by the engine cylinders to operate. The head refers to a fitting between the engine block and the piston cylinder. The head seals the process of combustion and prevents the engine oil from mixing with the coolant in the combustion chamber. The engine block is essential for the internal combustion of an engine. It provides the structure for attaching the cylindrical bored holes, the gaskets, valves and seals. The oil pump is used to pump and circulate the oil which protects the moving parts of the engine and consequently increases the lifespan of the moving parts. The primary function of the oil pan is to form part of the crankcase. It also contains the engine oil prior and after circulation on the engine. Surrounds the crankshaft and has an amount of oil which collects at the bottom. Controls the closing and opening of the exhaust and intake valves in the cylinder head either in a direct way via rocker arms, push rods and followers. Therefore, it depicts the power characteristics of an engine. Rocker arms are mounted on a shaft to provide oscillation around a certain point. Its function is to provide control of the opening and closing of the valves at specific instant of the cycle that is correct. Supplies spark plug that in turn ignites combustion of the air and the fuel. Proper timing of the spark is essential for proper combustion. Combusted gases are moved to a central collection unit known as the collector via the exhaust port. The basic function of the exhaust port is to move used gases. It connects the crankshaft and the piston. Due to changes of the piston, the rod can rotate at both ends to resemble the movements of the piston. Responsible for placing the camshaft of an internal combustion engine within the cylinder heads. It also drives the valves in a direct manner. Responsible for turning the piston’s in an up and down motion to resemble the movement of the crank.